See 9″ Chocolate Graham Cracker Crumb Crust. 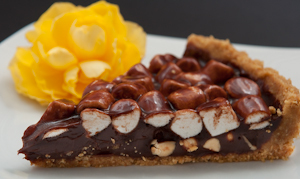 This entry was posted in Front Page and tagged crust, Dessert, graham cracker crust, graham crackers, pastry, tart, tart shell on August 5, 2012 by hfletcher. Please go to http://europeantarts.com and that should will get you to the pictures.